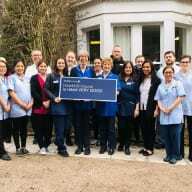 The care home, which provides nursing care for up to 41 residents, was rated ‘very good’ for supporting people’s well-being and care and support planning following an inspection in January. Hawkhill received ‘good’ to very good for quality of care and support, environment, staffing and management and leadership following its previous inspection. Mel Shearer, Home Manager at Hawkhill House Nursing Home, said: “We are all thrilled with this fantastic news. There is a wonderful community spirit at Hawkhill House, with residents, family members and colleagues all working together to make it a great place to be part of, and it’s lovely to see that reflected in the report. “This rating is testament to the hard work of so many people and the investment that Caring Homes has made in ensuring we have the resources we need to deliver the very best care and support. They found that there were very good personalised care plans in place for each person. This was further supported when they heard from residents who were happy to share that they were delighted with the genuine warmth and compassion they received and saw other people being given. In addition, inspectors were pleased to note there had been a number of improvements made to the environment over and above those previously identified, with the inclusion of new lighting, handrails, furniture, a redecoration and creation of themed wings. Hawkhill’s Lissys Astroza (Care Newcomer), Sarah Borthwick (Nurse of the Year) and Jacqueline Zenteno (Meaningful Activities) were honoured last year at the Scottish Recognition Awards. The post Caring Homes celebrates ‘very good’ double from Care Inspectorate appeared first on Care Home Professional.